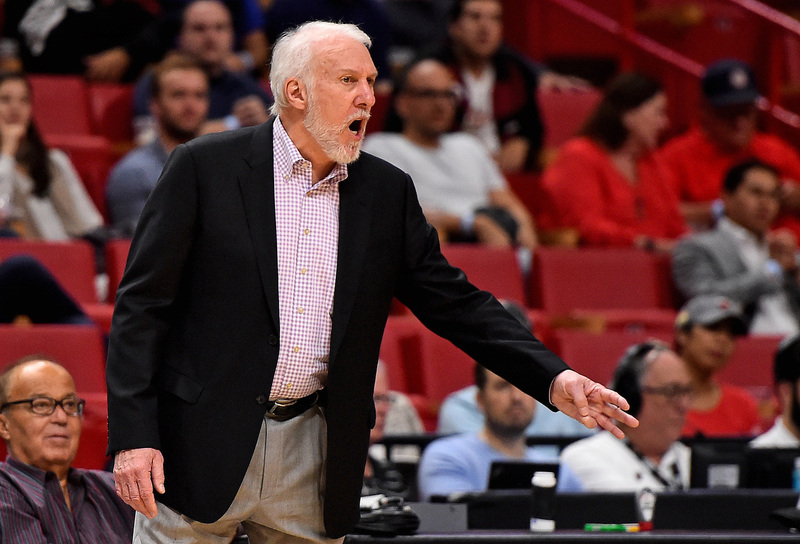 San Antonio Spurs head coach Gregg Popovich reacts during the second half against the Miami Heat at American Airlines Arena in Miami, USA, Nov 7, 2018. Now Team USA really is Gregg Popovich's baby. He's been the national team coach for a few years, but there was never a guarantee he'd actually get to lead the Americans in competition. Team USA first had to qualify for the FIBA World Cup, which serves as a springboard to the 2020 Tokyo Olympics. With that now done, Popovich can start lobbying players to go to China with him. "I just think it would be inappropriate for me before games to go up to one or two guys on each team and say, 'Hey, are you going to play for us this summer? I'd really like to have you,'" said Popovich, president and head coach of the NBA's San Antonio Spurs. Jeff Van Gundy guided Team USA through qualifying, earning a spot in China with a squad comprised of mostly NBA G League players. He finished 10-2 when the Americans beat Argentina 84-83 on Monday night in Greensboro, North Carolina. "Jeff was remarkable. Spectacular. Off the charts what he did to qualify the US for the world championships," Popovich said. "He put together about five different teams, mostly different players each time in a short amount of time they had to get them ready. "If they didn't do well, the US doesn't go, so he deserves a lot of credit for doing that on his own and I'm really grateful to him." The minor leaguers will now give way to NBA stars this summer. Popovich, who succeeded Mike Krzyzewski as national team coach following the Rio Olympics, said he doesn't believe anybody has committed to playing. The Americans compiled a national team pool of more than 30 players they can choose from, knowing top stars such as LeBron James are unlikely to want to play consecutive summers. They will trim that to a smaller number to invite to training camp in Las Vegas this summer, where the final roster of 12 will be selected. Unlike Krzyzewski, who rarely saw his prospective players while coaching at Duke, Popovich is around them all the time during the NBA season. "And I hate half of them," he joked. "It's going to be really tough to coach them." USA Basketball leaders haven't begun reaching out to World Cup prospects yet, needing to devote their time first to the revolving-door rosters of the qualifying games. With that behind them, national team managing director Jerry Colangelo and director Sean Ford can begin assembling the next team - without Popovich's help. "Jerry has been the wizard of that, he's been the guy who's put those teams together along with Sean Ford," Popovich said. "The two of them have done yeoman work over the years in putting the groups together and they're good at it, so I'll leave all of that to them."